Perhaps all the recent experiments with cauliflower are really starting to pay off. I genuinely liked the magic tabbouleh, but this just might be even better: miracle sushi! A no-carbs treat for guilt- and gluten-free gluttony! Though sushi isn't exactly up there with the worst dietary choices anyway, is it...? 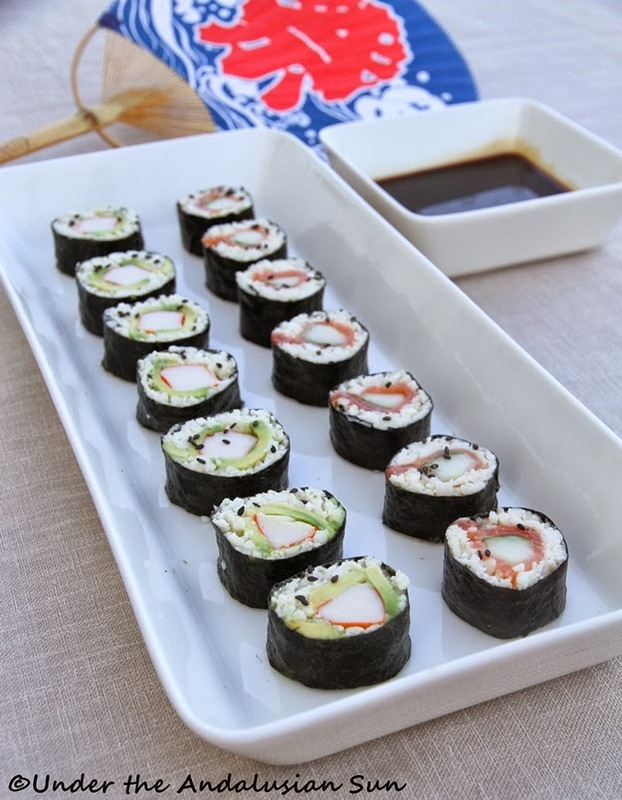 The inspiration for these came from California-rolls, as they also provide yet another way to use the avocados I nick from the next door neighbour. This makes roughly 6 rolls, which (depending on the size of your makis) equals 36-48 pieces. Grate cauliflower and steam until nearly done. Let cool. On its own or using one of those handy sushi-cooling-wafting-fans you got just for the purpose (don't tell me you haven't all got one?!). In the meanwhile mix mayonnaise with the rest of the ingredients. When cauliflower has cooled, stir in enough mayonnaise to make it a bit stickier - depending on the size of the cauliflower 3-4 tbsp. Place the nori sheet on a bamboo mat and spoon the cauliflower mixture on the sheet, leaving about 1 cm border in the bottom and about 5 cm border on top. Spread a thin strip of wasabi paste the cauliflower mixture and scatter black sesame seeds on top. Then place the filling: avocado sliced lengthwise into thin slices and the crab sticks (2/ roll) in the middle of the avocado layer OR salmon slices and about 1 cm thick stick cut lengthwise from the cucumber you've cut lenghtwise in half and scooped out the seeds). Wet the upper edge lightly to help it seal and, with the use of the bamboo mat, roll the seaweed roll tightly. Keep in the cold for about an hour before cutting it as this helps the roll stay firm. Then, using sharp knife, cut into pieces. First even out the ugly, flimsy ends, then cut the roll in half and then each half into 3-4 pieces. Serve with soy sauce, gari and (if desired) more wasabi. Oh, and this is our entry in Finnish food bloggers' monthly food challenge. This month the theme is "balls and circles"! I'm counting on your votes and will keep you posted when and where to vote! Crab sticks have about 13g of carbs per stick. So this is NOT no-carb.